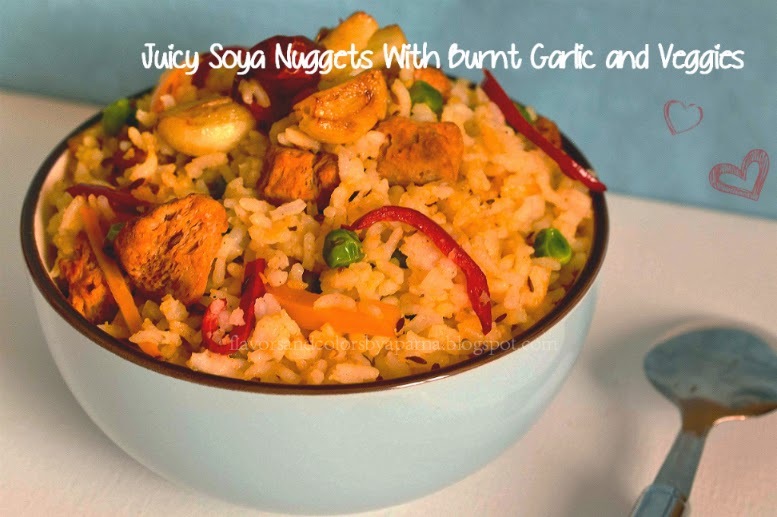 A favourite recipe of mine with fascinating fusion of flavors coming from juicy soya nuggets and burnt garlic! When JD from Jayanta's Home Kitchen posted his recipe for "Juciy soya nuggets with burnt garlic", I tried it the same day during lunch time [Any recipe with garlic and I cannot hold back myself, moreover his recipe looked so simple, had to try it that day itself]. 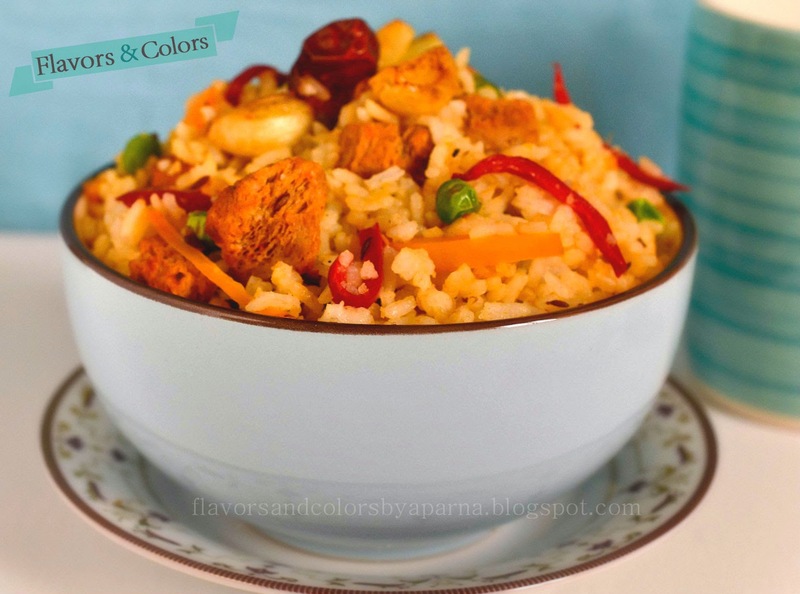 The enticing aroma wafting through my kitchen fired up my hunger pangs and I ate to my heart's content, which meant nothing was left for my hubby :P. This rice is not only delicious but also healthy and quick. After my first attempt, I adapted his recipe by adding extra veggies and an extra dose of burnt garlic for that awesome flavor. Prepared it twice after that and both times my family enjoyed it. Below is the recipe that I adapted from JD's recipe. Keep your vegetables ready. Finely chop the garlic and keep it aside. Meanwhile, heat olive oil in a wok. Add few garlic cloves [crushed] and saute them till golden brown. Take them out and keep it aside. In the same wok, add finely chopped garlic on high flame and stir it till they turn golden brown. Sim the flame, add 1 tsp of cumin seeds, 2-3 red chilies, 1 tsp of red chili powder, sliced capsicum and handful of green peas. Fry it for a couple of minutes. Next add soya nuggets and mix well. Stir fry for two minutes. Add the cooked rice, mix well and cover the pan. Cook it on low flame for 5 minutes occasionally mixing the ingredients in the pan. Switch off. Garnish it with sauteed garlic cloves and serve it hot. Sending this as an entry to "Flavor up with spices #2- Cumin"
Burnt garlic gives a fantabulous aroma to watever they are added, rice looks nutritious and filling..
Thnks Smitha, Nandoos Kitchen, Priya S!